Moving home is one of the most stressful things you will ever have to do so, New Home 4U want to lend you a helping hand to make the process a little easier. 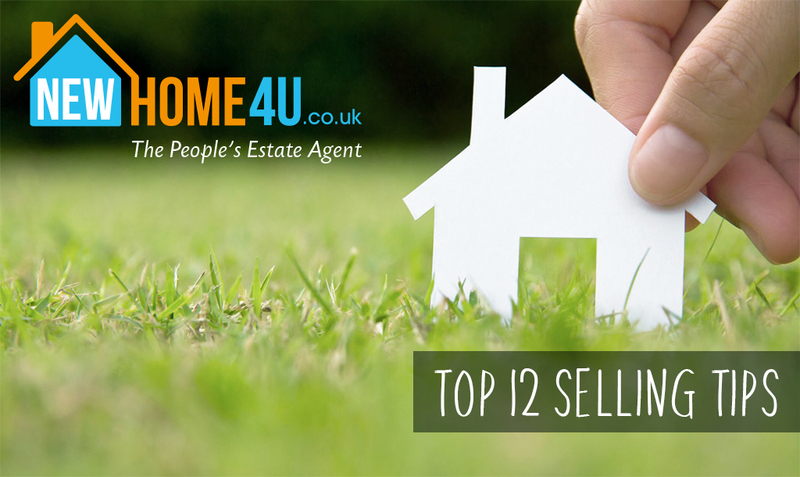 We've put together 12 of our best tips to help you sell your home. Selling a home is a stressful business. So choosing the right estate agent who is going to minimise worry and maximise results, is a vital first step and will have a big impact on how quickly you sell your home, and at what price. You’ll want an agent with proven and up-to-date marketing techniques, who can pull in maximum viewings – all the while remaining good value for money. By using New Home 4U you are guaranteed a cost effective, friendly approachable service with great results! Most buyers form their first impressions within seconds of walking through the front door. You want them to walk up the drive or path already feeling impressed and excited to see more. So do what it takes to create that lasting first impression. Make sure the exterior of your home is up to scratch and if your front door or fence is looking tired, brighten it up with a lick of paint. Put up hanging baskets to add colour. If you have a front garden, spend a little time sprucing it up. A few plant pots and a clear pathway can make the front of your house more appealing. Quick Tip: If you don’t fancy painting your front door, then don’t forget to clean it, it can make a huge difference. Making your home attractive to a buyer needn’t mean an expensive décor overhaul. Chances are it won’t be to the buyer’s taste anyway and will be replaced as soon as they move in. What you do need to think about though is making sure your rooms are clutter-free and as light and airy as possible. A mirror hung in the hall can give the illusion of space and a few vases of flowers or some plants can freshen up the house. So take some time to clean each room from top to bottom paying special attention to high impact rooms such as the kitchen and bathroom. You should also think about having a spring clean; if there’s too much furniture, and things like children’s toys and unused gym equipment lying around, it can make the property feel smaller. Gardens or any type of outdoor space can be another great selling point – but an overgrown jungle could see your buyer running mile. Not only will the space look smaller and ‘forgotten about’, if paying out for a gardener isn’t in your viewer’s plan or budget, it could completely put them off the property. 9. Stay out of the way! When potential buyers come to view your home, let them wander freely around the house with the agent (they will tell you what you want to her, they’ll tell the agent what you don’t want too!). You want them to feel comfortable and as though they can spend time looking at each room freely. Be ready also to answer any questions after the viewing. Obviously there will be other factors you need to take into consideration such as how quickly you need to sell and whether you have found somewhere to move in to yourself.